Buying your first set of BASE gear? It’s an exciting, and confusing, experience and we’ve all been there! There’s a lot of nonsense out there, so let’s cut through it. Here is an objective overview of some of your options along with the associated pros and cons. Let’s start at the pilot chute and work our way down! 1. Pilot Chute Selection: Well…what kind of jumps are you going to do? Check out this matrix to gain an understanding of what PC is appropriate for the jumps you’ll be doing. Canopy weight can also play a part in pilot chute selection. A lighter parachute may not need the same drag as a larger, heavier parachute. But in general, every BASE jumper will likely end up with a “quiver” of PCs unless they only jump very similar objects, and in the same manner each time. PCs are tools that need to be changed when the task changes. Start your collection with a 42” (It’s in the middle of the range and used during most bridge first jump courses.) and build from there. 2. 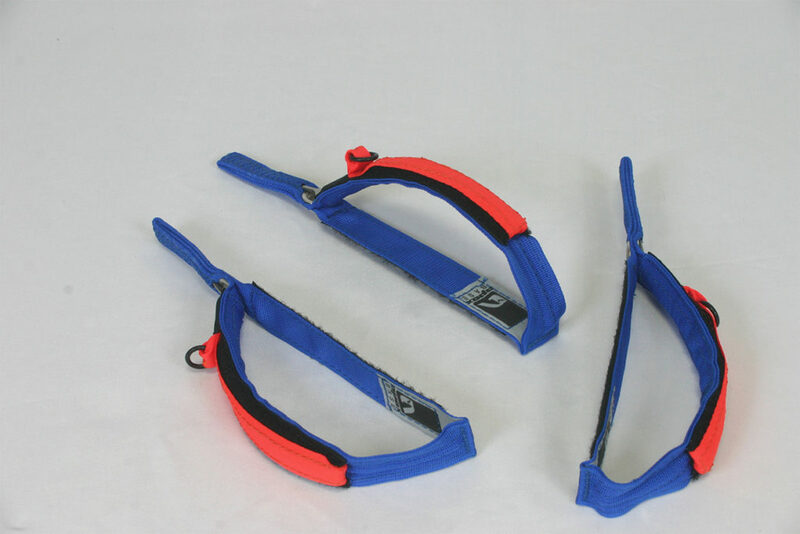 Bridle: Most bridles are 9 feet in length (measured from PC to the first pin) and these can be used for any BASE application from low slider-off jumps to big wall wingsuiting. Apex BASE offers upgraded bridles which come affixed with a magnet which mates to another sewn-in magnet on the rigs right shoulder. 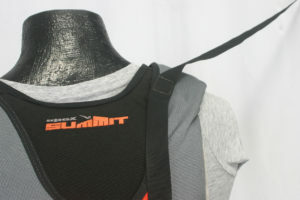 This feature is used during handheld jumps to provide bridle control during the climb to exit and during freefall. Specialty bridles do exist (for static line jumps, for example), but for a first rig a standard 9 foot bridle (with or without a magnet) is ideal. Magnet Bridles are a nice option for handheld jumps. a. Size: BASE jumping is not skydiving, and high wing loading is not cool, nor better, nor more desirable. In general we recommend that jumpers choose a canopy that places their wing-loading around 0.675. To calculate your wing-loading take your weight and divide it by your canopy size. For example: 175 lbs. / 260 sq./ft. = 0.67. More info on this topic HERE. 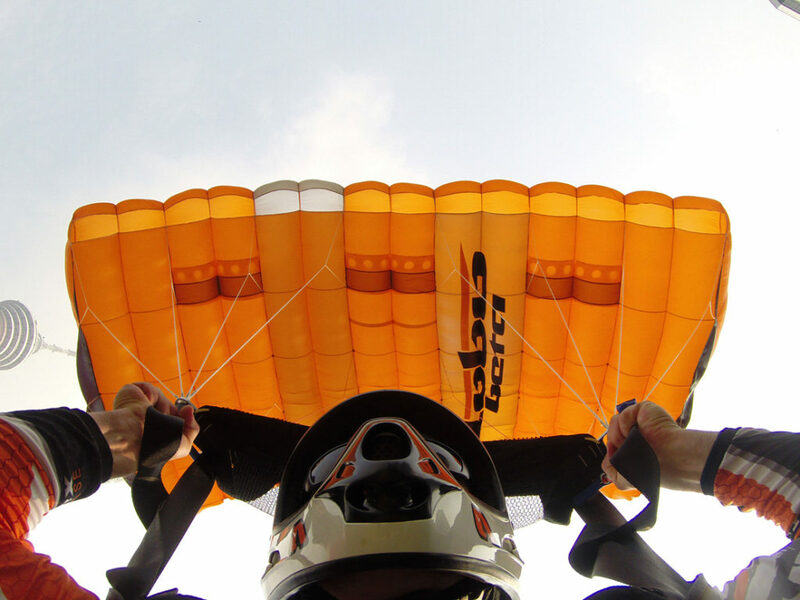 b. Vents: Bottom surface vents are one element that make a parachute suitable for BASE jumping. But many jumpers have a misconception when it comes to vents: “The lower you go the more vents you’ll want.” The reality is that vents are complicated and their impact on opening speeds will vary greatly depending on vent size and valve construction. We recommend speaking with the manufacturer during your order to discuss their specific vent technology and how to best meet your needs. Just be aware that counting the number of vents on your bottom skin doesn’t tell you all you need to know! Bottom skin vents are an important safety feature on modern BASE canopies. c. Lines: Once again, BASE jumping is not skydiving. In an environment where heading control and shock absorption are critical, dacron line has proven to be the superior line material. When reduced weight/bulk is desirable, a combination of dacron line weights can be used throughout the line kit to ensure strength where it’s needed and allow for reduced mass where appropriate. Now for the most important question: Black or white lines? d. Glide: All canopies are marketed as having “great glide” but the reality is that some are better than others. Some canopies are well known for being very solid in turbulence and in deep brakes, but these same properties necessarily eat into glide potential. Think about where you’ll be jumping. Do you have long flights to the landing area? Are your landing areas large and forgiving? If so you’ll be better off with a flatter gliding canopy. Alternatively if you like jumping into small, technical landing areas then you should opt for a more conservative canopy. e. ZP Nose/Top Skin: Some canopies offer an optional (or standard) ZP nose or a hybrid top skin. This technology has some pros and cons. 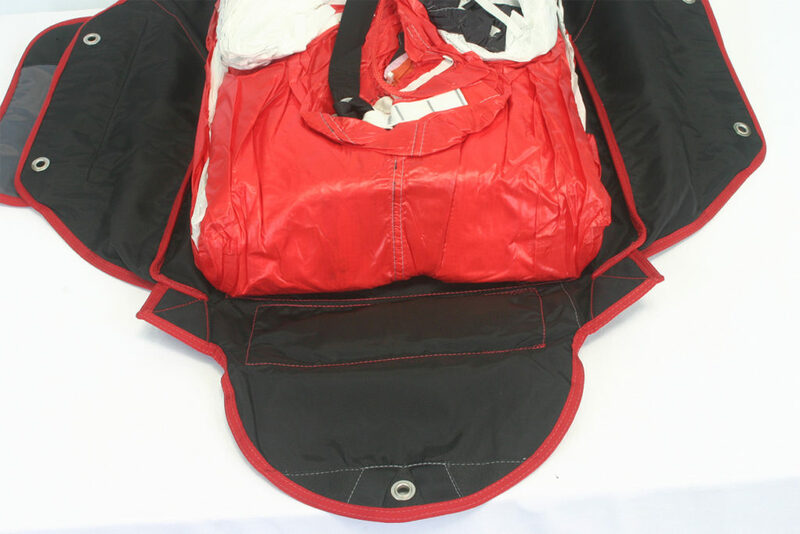 On the pro side the ZP top skin can improve durability and longevity at that section of the canopy. On the con side many newer jumpers have found it difficult to pack and as a result opening consistency can suffer. Canopies with a ZP nose have also have harder openings and higher pack volume when compared to their full F-111 and UltraLite counterparts. f. Slider: Large mesh? Small mesh? Sail? First of all, unless you are skydiving your BASE canopy then just take sail off the list. Large mesh is most common but if you’re primarily in the terminal environment then you should consider a small mesh slider. For more detail you can see the following aforementioned PC/slider chart. 4. Toggles: A BASE toggle should be easy to grab, easy to release when grabbed, and must keep the deployment setting secure during opening. All major manufacturers offer appropriate slider-off toggles standard with their container systems. Apex BASE also offers slider-up line release toggles which can be cutaway during certain canopy malfunctions. If you plan to play in only one environment then having an appropriate single pair will work for you. If you’ll be in both environments then both pairs are recommended. On slider-up jumps, WLO Toggles with line-release functionality are the ideal solution when dealing with certain parachute malfunctions. a. Pin Protector Flap: If you are jumping in the terminal environment the security of your pin cover flap is critical. There have been some scary videos released of protector flaps opening up, exposing the bridle, and occasionally popping pins mid-flight. Make sure you’re buying a container that is designed to protect your pins not only while climbing ladders and scrambling down to exit points, but also during freefall/flight. d. Bottomless Corners: They are simply better. There’s no disadvantage to having them on any style of jump. They are far superior in tracking and wingsuit applications and allow of easier canopy extraction during head low deployments. Most modern rigs have them, but if you’re in the used gear market be sure to ask! 6. Used Gear? Many new jumpers turn to the used gear market for their first rig. The reasons are clear: cost, cost, and cost. While you can find cheap used gear in the marketplace, we would encourage new jumpers to price out the cost of a new set of entry level gear (LIKE THIS). A basic kit with only need-to-have options will frequently come in at close to (or under) the cost of a used system. It’s always more desirable to have new gear built to fit you correctly. If you do purchase used gear however, we would encourage you to send it to a qualified rigger for a thorough inspection before putting any jumps on it. Apex BASE provides inspection services for gear from any manufacturer. There you go! This should get you started, and if you run into any more questions we highly encourage you to contact us at Apex BASE. Nothing makes us happier than to talk BASE with our customers!